I see this in my life: my life contains many people, and I’m lucky enough to have surrounded myself with people who mostly provide lift. They inspire me, hold me accountable, find happiness for my successes, lend a hand when I need it, give me advice, and root me on. I wouldn’t be where I am without these people. I have been lifted by them, and that fills me with joy. But I’ve seen others who provide drag on the people around them. They criticize, have a negative attitude, complain, and in a thousand small ways show you that you shouldn’t do what you’re doing. They mean well, and they don’t even realize they’re providing friction and making things difficult. You might not actually know, so pay attention today to how you interact with everyone. For some, you might be positive, but for others you might be negative. See if you can find it in you to provide lift instead. 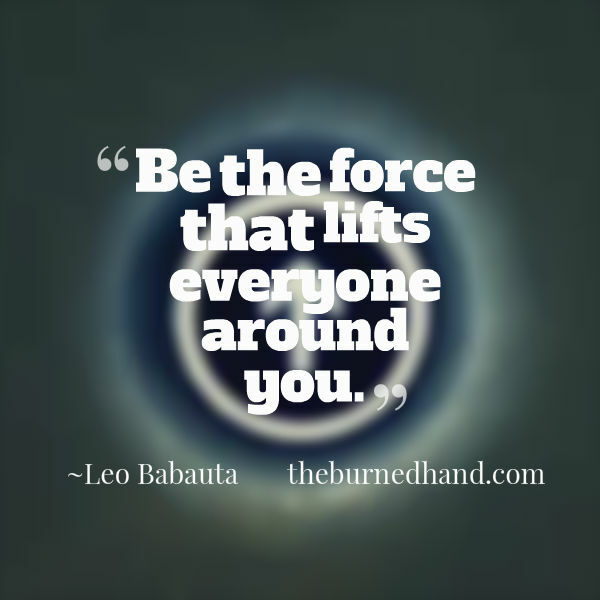 Be the force that lifts everyone around you.